OTTAWA, Canada, March 27, 2019 - Volleyball Canada has finalized its 2019 men’s team roster of coaching staff. 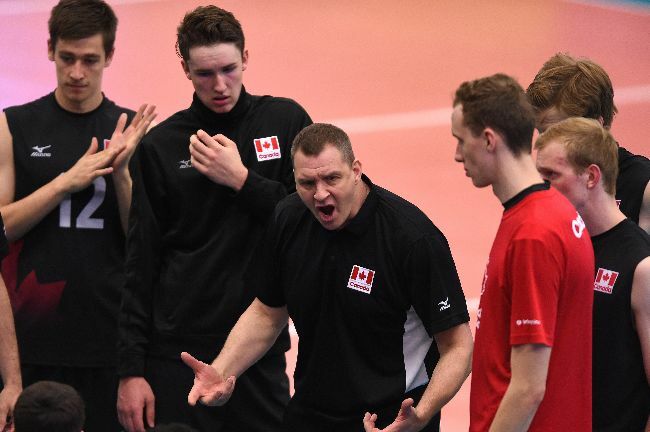 "We have gathered a great mix of veterans and younger talented coaches this year, and we’re looking forward to another action-packed season for the men’s program," said Julien Boucher, Volleyball Canada High Performance Director (Indoor). Joining the senior men’s team under Head Coach Glenn Hoag is Gino Brousseau. Brousseau, the Laval University Rouge et Or men’s team head coach since 2010, is a former National Team player and member of Volleyball Canada’s Hall of Fame. He competed in the 1992 Olympics as well as World League competitions, a World Championship, the World Cup and the World University Games. He also enjoyed a stellar professional international career competing for 13 years as a professional volleyball player in Italy, Japan and France where he helped his teams win numerous titles. Brousseau was part of teams that won the French Championship five times and the Coupe de France on four occasions. Brousseau will assist Hoag alongside returning assistant and Volleyball Canada men’s NextGen coach Dan Lewis. The 2019 senior B men’s team will be led by John Barrett. Barrett has been the University of Toronto Varsity Blues men's volleyball program head coach since 2011-12. In the spring of 2018, he was voted President of the U SPORTS men's volleyball coaches association. As an athlete, Barrett was a CIS gold medalist and tournament MVP (1985) while competing for the University of Manitoba. He competed at the 1984 Olympic Games and the 1983 Pan Am Games and at the 1990 world championships, and went on to serve as head coach for both the men's and women's beach volleyball teams at the 2003 Pan Am Games. Barrett also brings the experience of playing 14 seasons of professional volleyball in Europe. Joining John Barrett as an assistant will be Ryan Marsen. Marsen is head coach at Olds College in Alberta, and has been a guest coach at National Team camps, named Head Coach of the Junior National Team, and was the Head Coach at the Volleyball Canada Centre of Excellence in Calgary. He was an assistant coach for the National B team who won a silver medal at the 2007 FISU games in.